In a sold out EKKO the show was kicked off by Rodrigo Amarante. Amarante is known for his work with Devendra Banhart and Little Joy and now tours with Olsen to promote his first solo LP, Cavalo (2014). Although Cavalo is a fresh piece of work, Amarante’s show was contained an obvious set of intimate Portuguese songs that we’ve seen and heard it all before in different sizes, shapes and formations. Even Amarante openly wondered why nobody walked out of the concert room… So he said with a smile of his face and knowing he got some full exposure for his new LP. After this it was Olsen’s turn to hit the stage. As said Burn Your Fire For No Witness got a positive review on this site. Whilst the ending of the album was over ambitious to my opinion the whole outline of the album was made of high standards. Olsen’s voice is clear and strong, so high standards were to be expected for this show. When all things are considered, I have to conclude that Angel Olsen did not experienced an easy evening in Utrecht. Understandably the heavy touring schedule left a mark on the band’s fatigue. Also the technical sound alignment in the beginning and the heat during the concert wasn’t very helpful as well. Nevertheless, the band made the best of it and Olsen’s voice seemingly was not affected. That a good thing on it’s own. Yet, on a different level one could question if a live act like this suits Olsen best. On more than a few occasions Olsen had to hold back, giving the impression she was supporting the band and not the other way around. Musically speaking the show therefore was not very exciting. Regrettably the high standards I expected beforehand were therefore not redeemed and sometimes even fell into phases of mediocrity. Seen live on Saturday September 20th 2014, EKKO, Utrecht. 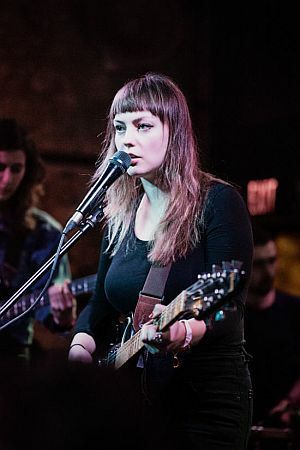 This entry was posted in WRM and tagged 2014, Angel Olsen, Burn Your Fire For No Witness, Cavalo, Devendra Banhart, EKKO, Emily Elhaj, Fleetwood Mac, Joshua Jaeger, Little Joy, live, review, Rodrigo Amarante, Utrecht. Bookmark the permalink.